Russ is a retired scientist whose successive careers found him working as a biology professor, a research biologist, and a science manager . Peg's careers included serving as a public school teacher, a university administrator and a college professor . Not surprisingly, some of our experiences in our several careers have found their way into our books. Our newest book is an exception, however, having relatively little to do with experiences in the workplace. Second Wind on the Way of St. James is a novel. Set on the Camino, it has been inspired by our experiences and those of others who have walked on the magical path. 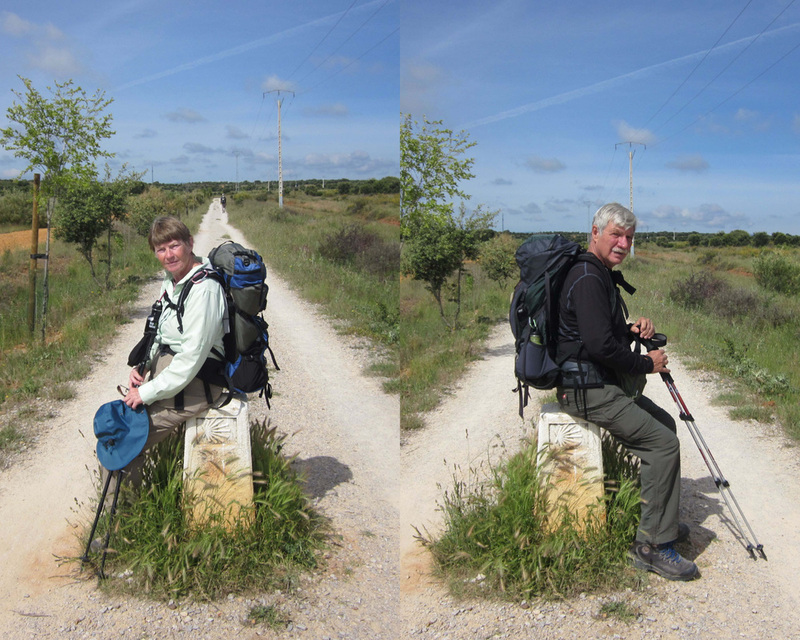 As retired professionals, the Camino appeals to us on several levels and, much to our surprise, keeps calling us back. We are seven-time walkers on the Camino, having completed our seventh walk in 2015. In 2008 we walked 100 miles in France, bussed ahead, and logging 50 more miles, walked over the Pyrenees from St. Jean Pied de Port to Pamplona. Returning in 2009, we walked the nearly 200 miles from León to Santiago, where we received our Compostelas—certificates of completion. In 2011 we walked the nearly 300 miles from Pamplona to Molinaseca, completing what remained of the French route in Spain, and repeating some of the trail walked in 2009. In 2012 we walked parts of the Via de la Plata, traveling northward from Cácares to Zamora, a distance of about 150 miles. In 2013 we again walked from León to Santiago, this time with companions, and traveled on by bus to Finisterre, on Spain’s western coast. That year, we also served as volunteer hospitaleros. For two weeks in May we greeted and ared for the guests at the municipal albergue in El Burgo Ranero. In 2014 we walked the Portuguese Route and then part of the route to Finesterre and Muxia. This year, we started back in France where we ended out 2008 Camino. We walked to St. Jean Pied de Port and then took the Napoleon Route over the Pyrenees. We had walked the Valcarlos Route on our earlier Camino. We continued on to Pamplona, on which point the temperatures climbed to more than 90 degrees. We had planned to walk a few more days but opted instead to visit a few iconic Spanish cities: Pamplona, San Sebastion, and Bilbao. Each of them added a dimension to our appreciation and understanding of the Camino experience and of Spain. In 2011, 2012, 2013, and 2015 we taught community education courses on preparing for the Camino at our local Santa Fe College, and taught a similar workshop in 2014. That experience and the excellent feedback we have received have encouraged us in our writing and motivated us to launch this website. Second Wind on the Way of St. James was first released in free Episodes on this website. Since August 2013 it been available in print and Kindle editions. To learn more about us, click here. Click on the dropdown menus above or here to learn about our books and here to learn about our websites and blogs. Send an e-mail to pegandruss@caminodreaming.net or leave a comment on the Camino Dreaming Blog.